Deadline reported, Netflix has renewed “The Umbrella Academy” for season 2. 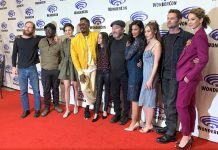 The original cast of season one is set to reprise their roles Ellen Page, Tom Hopper, David Castañeda, Emmy Raver-Lampman, Robert Sheehan, Aidan Gallagher, and Justin H. Min. The second season will have 10 episodes. The production will begin this summer. Steve Blackman is set to return as showrunner.